Upcoming event of interest to biodiversity fans! 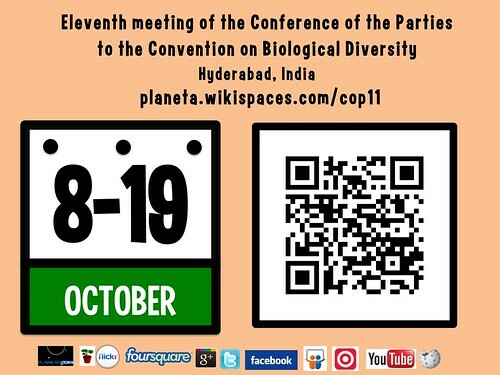 October 8-19 Hyderabad, India hosts the Eleventh meeting of the Conference of the Parties to the Convention on Biological Diversity. 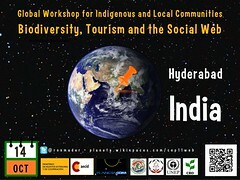 On Sunday, October 14 Planeta.com's Ron Mader will facilitate a one-day training workshop at CoP 11, Hyderabad, India. The Global Workshop for Indigenous and Local Communities: Biodiversity, Tourism and the Social Web will engage CoP 11 participants and colleagues around the world with new networking tools that highlight indigenous and local community tourism services that conserve traditional culture and local biodiversity. Many of the examples are drawn from the participants in the Indigenous Tourism and Biodiversity Website Award. For those interested, please register for the workshop and introduce yourself via the event page on Facebook. Also register for social web channels you want to master including Skype, Delicious, Facebook, Flickr, Foursquare, Slideshare, Storify, TripAdvisor, Twitter, Youtube and Wikipedia. You don't have to register for everything but you do need to commit to a schedule of regular use before, during and after the workshop. Reason: The value of the social web becomes clear through repetition and redundancy. Free wifi and livestreaming will be available to connect participants in the room with colleagues around the world. Free worksheets, handouts and Slideshare tutorials are available now. Comments welcome on Ron's blog.